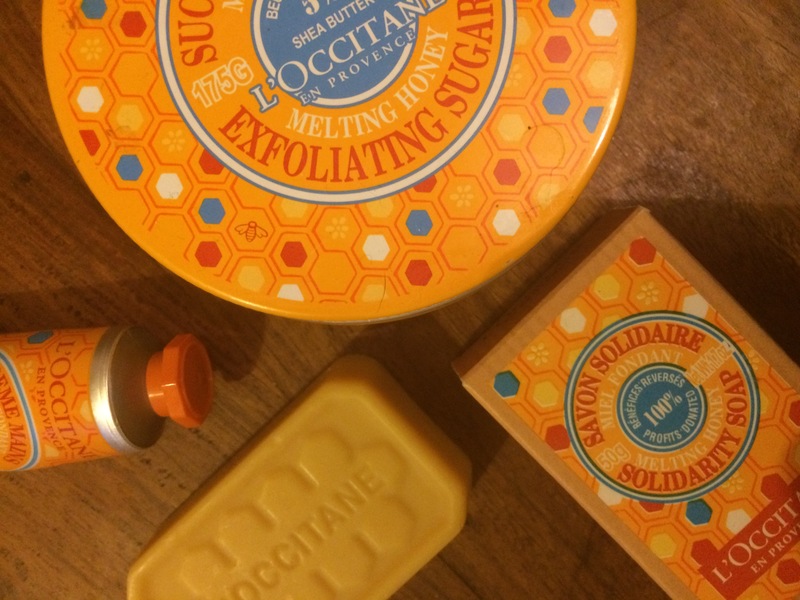 I am a real lover of L’Occitane’s Shea Butter products, so when I heard that they were launching a limited edition Shea Butter and honey collection I couldn’t wait to try it. I am always wary of honey-based beauty products, as often, they smell super sweet. Luckily however, the gentle scent of the new Melting Honey Collection is beautiful. Made up of six body care products, this collection includes a lovely honey hand soap. All proceeds from this will go towards paying for eye care and glasses for a patient in Burkina Faso in West Africa. The first thing that drew me to this range in my local L’Occitane store was how beautifully designed the packaging was. (I have a thing for cute packaging!) Each product is encased in a honeycomb-inspired, orange and yellow design, complete with cute little bee doodles dotted around. There are six products in the Melting Honey Collection – shower gel, hand cream, sugar scrub, hand soap, body cream, and lip gloss, but I only brought three of them. While I would love to try all of them, it was a little too pricey to get the whole collection at once. I opted for the Mleting Honey Solidarity Soap, the Melting Honey Hand Cream and the Melting Honey Sugar Scrub. 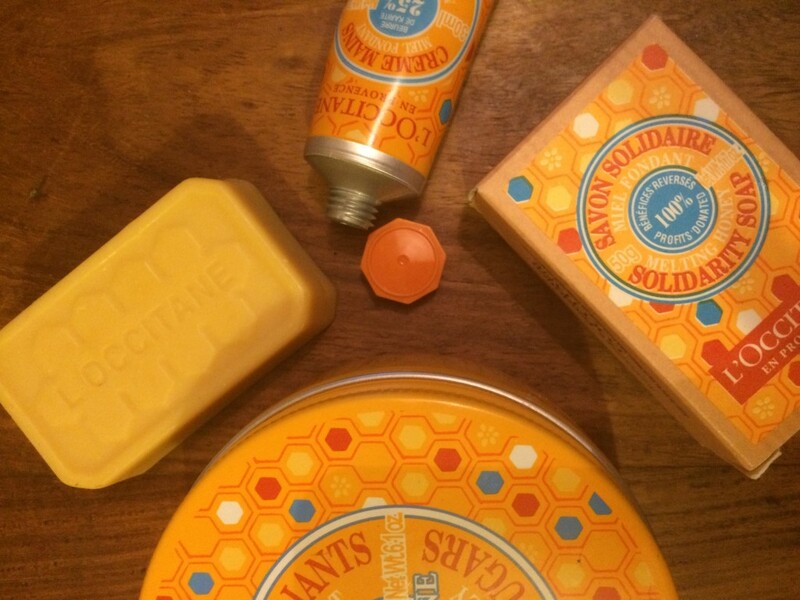 Once a year, L’Occitane releases a solidarity product that the profits from are donated to fight blindness across the world, this year that product is Melting Honey Soap. According to the packaging from this lovely little soap, 285 million people are visually impaired. The sad thing about this being that 80% of these cases are avoidable with treatment. This small soap, made from Shea Butter and Provencal honey, is perfect for cleansing and moisturising the skin. I must admit, I’m not normally a bar of soap kind of gal, I much prefer liquid soap, but for this divine little bar, I’m happy to make an exception. The thing that tends to put me off using bars of soap is the fact that they leave a film of oiliness on your hands even after you’ve washed the soap off – a real pet hate of mine. However, this soap, thankfully, doesn’t do this. All it leaves you with are soft, supple hands. (I’m going to have to try a few more L’Occitane soaps!) The other thing that I LOVE about this product is that thanks to the Shea Butter, it doesn’t dry my skin out like so many other soaps do. While out of stock online, you can pick up a bar of this gorgeous soap in your local L’Occitane store. 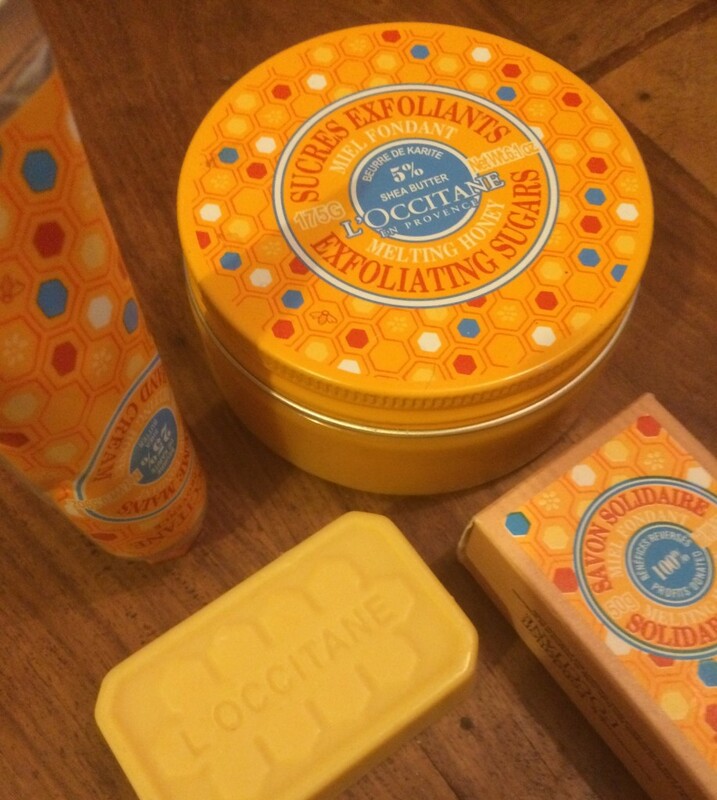 As you will know if you follow my blog, I am OBSESSED with the L’Occitane hand creams. When I first unscrewed the cute orange lid, I couldn’t get over how gorgeous the scent was from this cream. It’s not an overpowering smell, it’s just the right combination of sweet honey and milky Shea Butter, which I love. What I like about this Shea Butter based hand cream is the fact that unlike many other products, it has a unique whipped formula, making it airy and lightweight. When you squeeze it out onto your palm, you realise that the formula is not only beautifully mousey, but also that a little goes a long way. When it comes to my hands, the winter is a real problem for me. Thanks to the cold weather and the fact that my heating is turned up on high, they become dry, extremely easily. For me, this very hydrating hand cream is perfect, it absorbs quickly – within 40 seconds, and is non-greasy. Thanks to its 25% Shea Butter base, this cream left my dry, sore hands feeling soothed and comforted. I am SO IN LOVE with this, I’m just so sad that it’s limited edition. Of all the products in the collection, I have to say that this is my favourite. (I plan on stockpiling it once pay day comes around!) As we all know, with winter comes dry flaking skin – sigh, so having a good exfoliator to hand is a must. I normally swear by L’Occitane’s Ultra Rich Face Scrub, but when I saw the Melting Honey collection, I knew I just had to try the sugar scrub. When I brought this, I expected it to be soft and creamy like the Ultra Rich Face Scrub, so was a little surprised when I found it was set hard in the tin. Since I first started using it, it has softened up quite a lot, and is now more of a sticky consistency, almost like a salve. Containing sugar crystals and ground walnut shells, as well as 5% Shea Butter and lots of delicious Provencal honey, this balm smells absolutely amazing. Although this scrub can be used all over the body, I chose to save it for my face. (I plan on investing in the Melting Honey Ultra Soft Cream for my body when I get paid.) I am mad about this product, I love how sticky it feels when you apply it to your skin. I also love that when you wash it off, you’re left with skin that’s deeply hydrated. So much so, that I don’t tend to use a moisturiser after exfoliating, as the combination of honey and Shea Butter in the scrub leaves my skin feeling super soft and perfectly nourished. 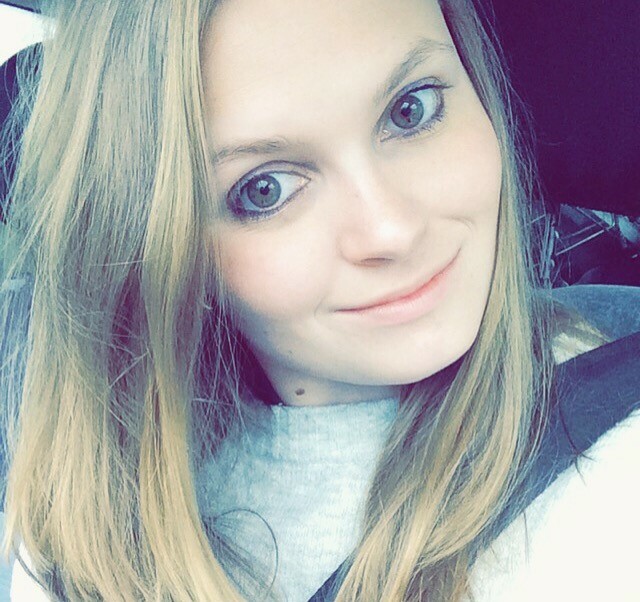 Overall, I love every item I have tried. For the winter, the Melting Honey Collection is perfect, as each of the products are super hydrating and leave your skin feeling beautifully soft and supple. 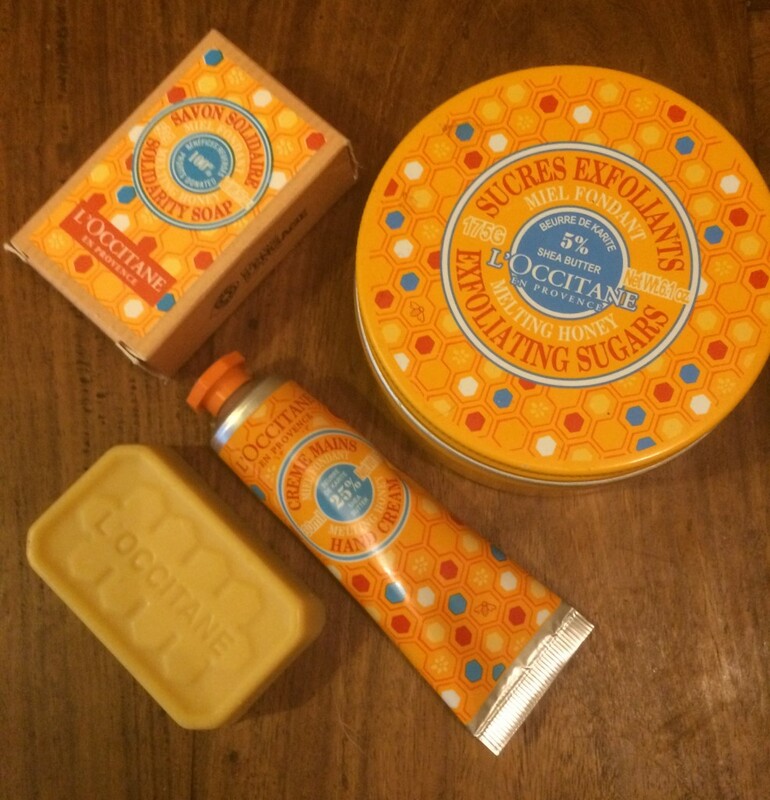 I am a big fan of L’Occitane’s products anyway, as the fact that they are so gentle means that I know I can use them without worrying about my skin flaring up. Would I buy these products again? Absolutely, although sadly, as they’re from a limited edition range, I probably won’t get the chance. Want to try these out yourself – you can order them online, here.